If you grew up in the South, you know there’s one thing treasured above all else. A precious item handed down, or passed down, from generation to generation. Some might argue it’s more precious than fine jewels, money, even gold. Every generation one matriarch is entrusted with it’s keeping. And with bringing it’s sacred, secret contents to every family gathering. If you haven’t guessed by now, I’m talking about the family recipe box/tin/book- whichever applies. Thankfully, ours was entrusted to my own Mom when my Grandmother unexpectedly passed. It was a huge blessing, and even a balm of sorts. Every time we enjoy her favorite dishes, or dishes that only she had made, it still feels like she’s with us at the family table every holiday and celebration. It’s both a way to honor her, and her legacy, and a way to continue to feel her presence in our lives. Most of her recipes are relatively straightforward, easy to understand, transcribe, and recreate. We’ve since discovered that these are either the recipes written in her own hand, or the family recipes from the Northern side of our family. The recipes from her Mom’s side, and especially the recipes from her Georgian MIL? Well, they’re a little bit harder. More of a challenge you could say. Why? Because instead of precise measurements, things are referred to as a dash of this, a heaping helping of that, and occasionally- a handful. Sadly, that’s a language that wasn’t passed down, and has since been lost to us. Luckily, with a bit of trial and error (and typically cutting out a whole lotta lard and sugar) we’ve been able to recreate almost everything that we’ve tried. So far. 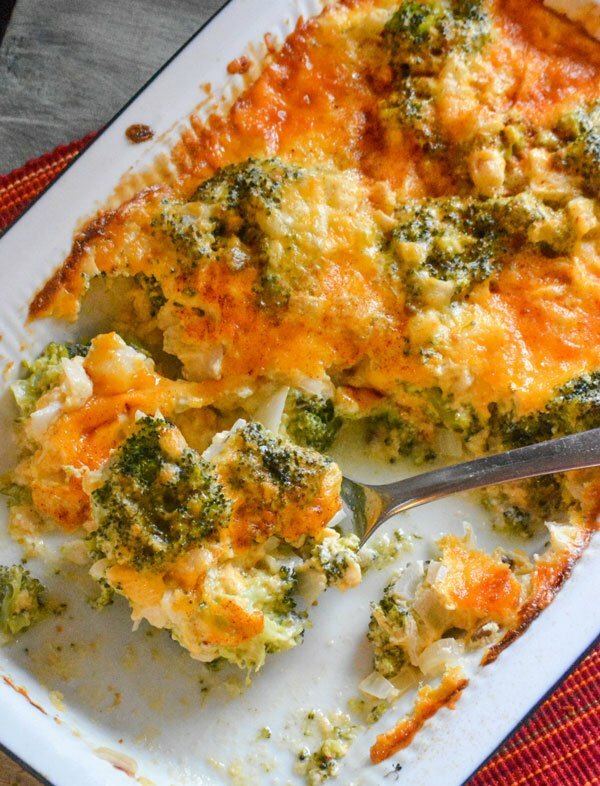 One of our favorite dishes, fortunately, was a Grandma original and included precise measurements, and steps, so even us Millennials will never suffer through a Thanksgiving, Christmas, or even Easter dinner without a heaping helpin’ of Grandma’s Cheesy Broccoli Souffle Casserole. 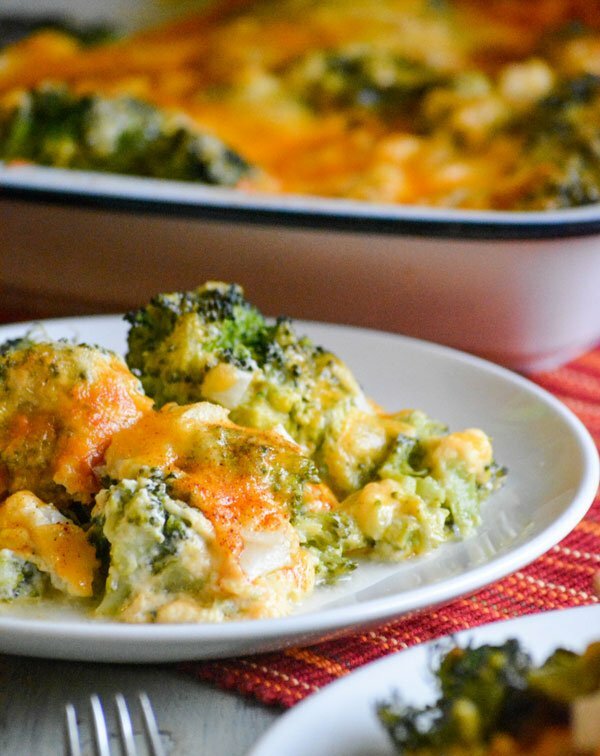 A cheesy vegetable casserole of some sort is a holiday must-have to pair with your meaty entree of choice. 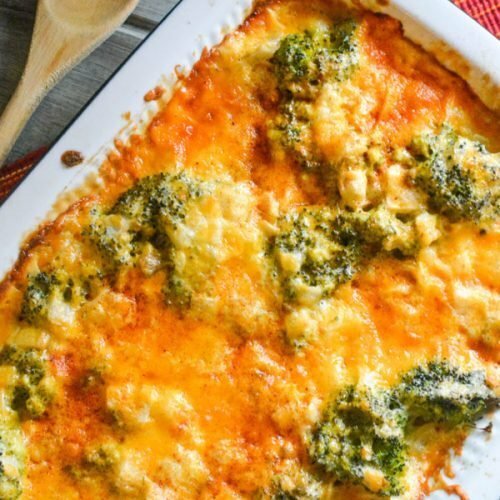 Whether you’re having a traditional ham, turkey, or even prime rib- Grandma’s Cheesy Broccoli Souffle Casserole is the perfect side dish to pair with it. 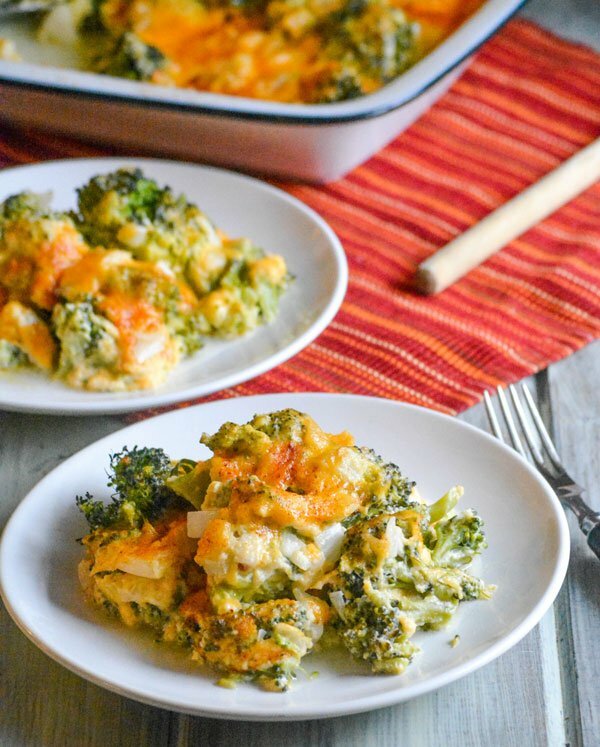 Chock full of yummy veggies, baked up with a yummy egg based souffle style filling, and topped with a cheesy, smoked paprika crust- it’s gonna be the stand out side dish to any meal you serve it at. It’s sure to become the next recipe filed away in your family vault. 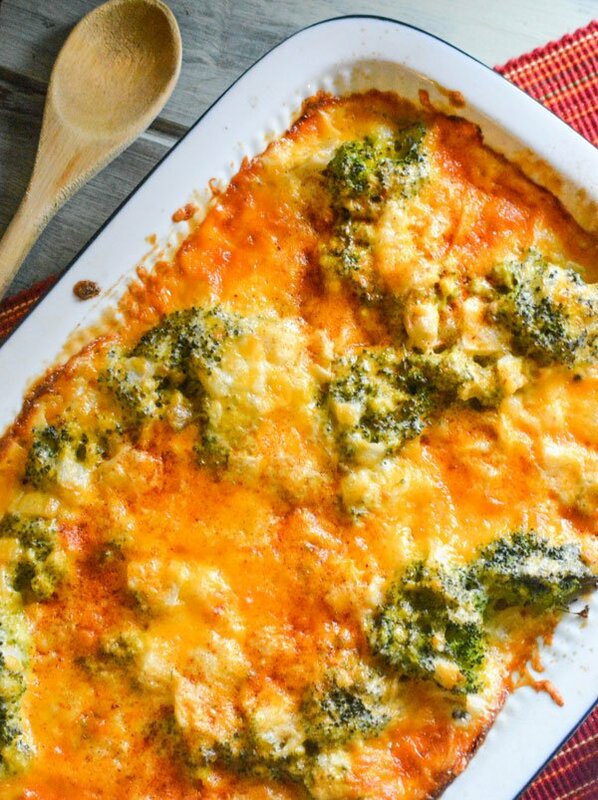 A cheesy vegetable casserole that pairs perfectly with any main meat for a comforting meal, fit for a crowd. 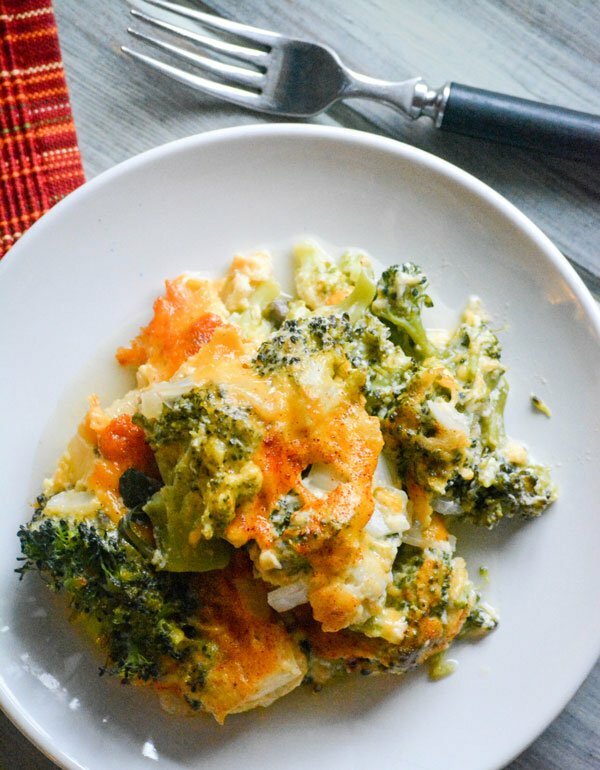 Cook the broccoli, drain thoroughly, and spoon into a lightly greased, medium-large sized baking dish. Set aside. In a large mixing bowl, stir together the onion, soup, 1/2 cup of cheese, milk, mayo, eggs, and red pepper flakes until evenly combined. Spoon the mixture evenly out over the broccoli. Using the back of the spoon, spread out as necessary. Sprinkle the remaining 1/2 cup of cheddar evenly out over top the casserole. Sprinkle with smoked paprika. Bake the casserole at 350 degrees for 45 minutes. Let rest 5-8 minutes before serving.